New Delhi: Granting Permanent Commission to women without opening all ranks for recruitment to them, without including them in the combat arms like the infantry and the armoured corps or on warships and submarines, smacks of ornamentalism. India is falling into that trap by celebrating Prime Minister Narendra Modi’s “gift” of Permanent Commission to woman officers. Permanent Commission is a service of 20 years, depending on eligibility and rank. Now that the announcement has been made, it is incumbent on the defence ministry to make the promise come true, in discussion with the armed forces. The usual practice before such an announcement would be for the government to first think it through. The opposite has been the case. It is a ‘shoot first, think later’ policy; a political ploy that establishes a false equivalence. At present, there are about 3,700 women in the military, all of them officers on Short Service Commission (SSC). This figure does not include the medical, dental and nursing corps, where women are offered Permanent Commission in any case. They are also offered Permanent Commission in certain wings — the Army Education Corps, the Judge Advocates’ General branch and similar wings in the Navy and the Air Force. On being commissioned from Officers Training Academies (OTA) in Chennai and Gaya (for the Army), the Indian Naval Academy in Ezhimala and the Air Force Academy in Hyderabad, they are expected to serve for a minimum of 10 years, extendable by four more years, depending on eligibility and willingness. 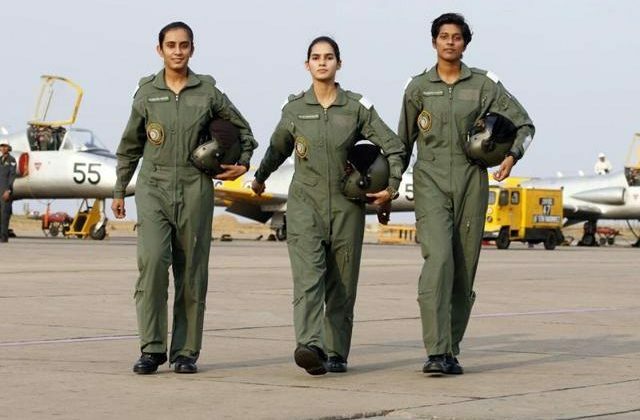 Only from last year has the Air Force begun inducting women as fighter pilots; there are six so far, who are yet to be declared ‘fully operational’. In the Navy, women do not serve on warships and in submarines. The Navy is still wary of putting them on ships because “men may be going around bare-bodied” — not necessarily by choice, but because the Indian Navy operates in tropical waters, where temperatures on deck may soar to 50°C and to 60°C in the engine rooms. Women in the Indian Army are yet to lead battalions in war or in counter-insurgency. They are not deployed with frontline units, even though they do serve in field areas. The thought process behind this is the “risk” of being in direct contact with the enemy, putting not only life and limb in danger, but also being caught in hostage situations and entrapment behind enemy lines. In a nation where the beheading of soldiers on the Line of Control incites public passions to a frenzy, the political fallout of women, even if they may be soldiers, being taken by the enemy with the risk of being brutalised, like Captain Saurabh Kalia in Kargil, or worse, can only be guessed. Was there an alternative to this “gift” of Permanent Commission? Yes. There are examples from within the country, in our own history, as well as illustrations from international experiences that could’ve helped. Captain Lakshmi Sehgal was tasked by Subhash Chandra Bose to command the Rani Jhansi Regiment of the Azad Hind Fauj against the British in 1943. Internationally, the Soviet “Red Army”, way back in 1939, asked the women joining its ranks if they were willing to operate behind enemy lines. Those who volunteered were taken out of the combat support arms and put into frontline units. The legendary Lyudmila Pavlichenko was among 2,000 snipers that spread panic among the Nazis. They were armed with, apart from their personal weapons, a dope and asked to bite the bullet if they were captured. Currently, there are more than 30 countries, including Pakistan, in which women serve in the military services. In the irregular military forces, like among the Peshmerga in Kurdistan, eastern Turkey, women have taken the ground battle to the Islamic State. In modern militaries of the developed world, women serve in all ranks with men, in ships that sail choppy seas, inside the hothouses that submarines are, and in helicopter gunships that fly into fire. They earn their stripes, rise to be officers, and command the respect of troops, without needing “gifts” to justify their merit. The Prime Minister’s “gift” could actually end up being counterproductive, as in the present set-up, serving male officers may get heartburn when they see women officers get the cushy office jobs, since they are not allowed onto the battlefield by convention. It might lead to the feeling that Permanent Commission is like a dole, a privilege conferred “undeservedly”. Far from creating equality, it might magnify the disparity. India has the world’s largest voluntary military. If the government is really serious about equality, not mere ornamentalism, women must also be able to volunteer to be commandos, special forces operatives, part of ghatak platoons, or evacuate two profusely bleeding casualties on just one pair of shoulders under heavy fire. The stars on their epaulettes should be equal to men in the military, not doled out as a political “gift”.